Leaving the winter rain on the cobbles of the City they passed by the olive tree in the charming courtyard and gathered in the impressive Banqueting hall for a glass of fizz before lunch in the parlour. The hall is one of the very few that was not damaged in the blitz and the beautiful oak paneling and much of the fabric dates back to the 1670s when it was rebuilt after the Fire of London. The Archivist, Sophie Bell, explained the origins of the Company in 1462 against the backdrop of the Stuart courtroom of which they are understandably very proud. 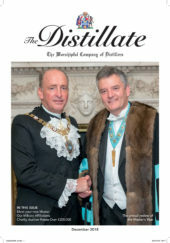 The Distillers’ Court has met there many times. Over the centuries the Tallow Chandlers became prominent for their candles, used even in street lighting and then as electricity took over their role, they moved on to become the main provider of soap, which a kind Lord Palmerston decided to remove the tax from to encourage cleanliness among Londoners. As the delicious lunch was served, the wine flowed, and the conversation gathered pace as everyone caught up with the news and made new friends. Quite soon it was time to jump into the waiting taxis to join the Livery who by now were enjoying a stirrup cup at the Apothecaries, and the event finished in noisy harmony as we compared notes and headed for home.